CRYPTO Markets Slowing Down -- Lowering RSI'ssteemCreated with Sketch. 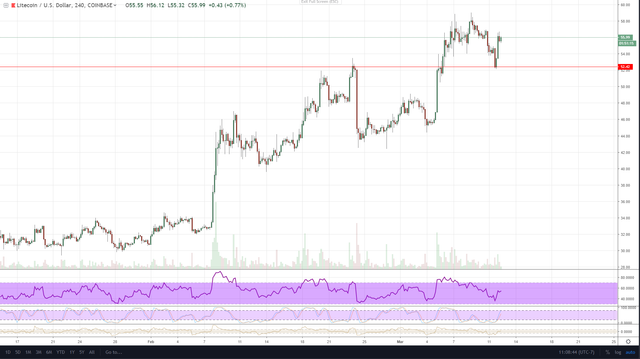 Litecoin pulled back a bit and bounced off of support like it should. Now, the bulls are taking the charge back, but so far we have volumes which are almost negligible. So far, they've had a struggle closing above the $58 level. Support does seem to be at $52.42. The rest of the cryptos are looking for some upside movement as well. We're fortunate not to be seeing another day of bear pullback. Not a whole lot to notice once again. Happy Tuesday!